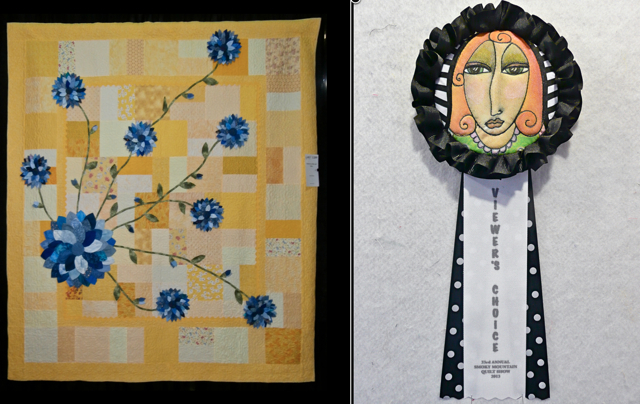 This weeks theme is wall hangings. 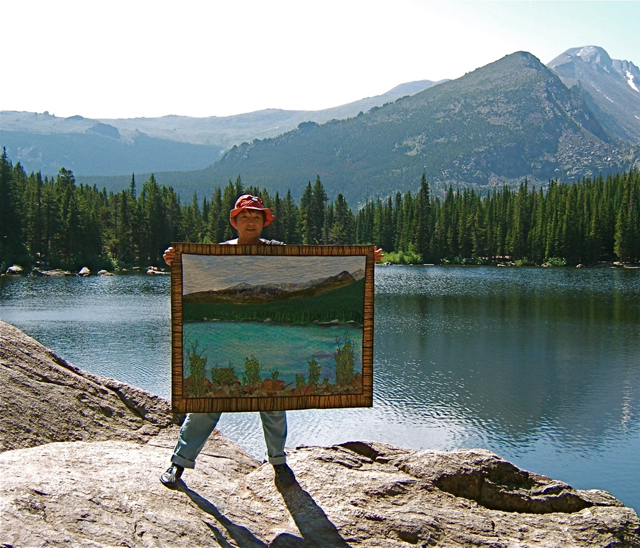 My "Bear Lake" is one of 67 entries from 9 countries, 4 provinces, and 22 states. Viewers get to vote for 6 favorites this time. I rarely find choosing my favorites easy so it's nice to get so many choices. Go here to vote for the ones you like before Monday at 6pm. I find it amusing that so very many people have pinned the tutorial I wrote when I made those shrubby trees in the foreground. In fact, 49 people have visited my blog just today to read that post. Over the years I've used a number of different ways to make trees. The technique I came up for creating these is easy and most effective. To read the story behind this quilt go here. 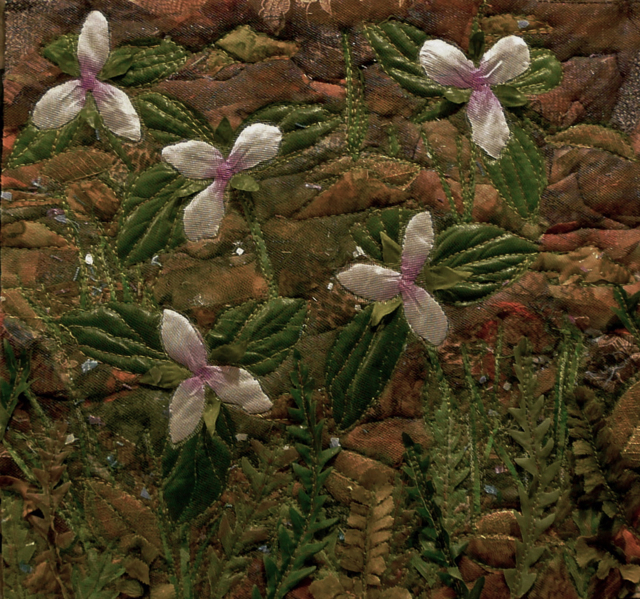 The stamen are embroidered. I used several shades of yellow floss in the 6-ply strand to stitch a variation of the bullion knot. 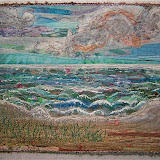 I opted for irregularity in those stitches to reflect reality of perspective and nature. Also, the trillium leaves have been highlighted with oil stick pastels as well as shaded around the edges with a dark blue water color pencil. I'm liking this piece a lot! However there were moments I considered scrapping it ... which means eventually cutting the woodland floor background into pieces for something else. My problem was that every color of tulle I placed over it to hold the sprouting plants in place "killed" the woodland floor hues. The whole piece just "died." It was pinned to cover the whole top. 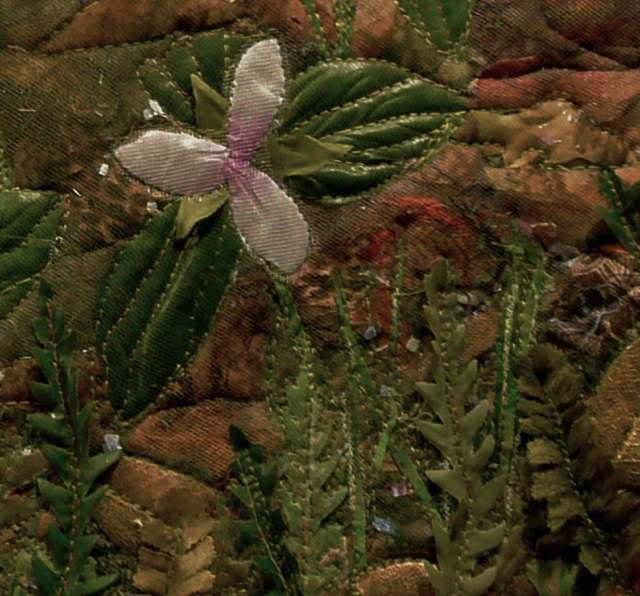 I stitched/quilted around the greenery then trimmed the tulle away from the woodland floor sections. Well, most of it. I see that some more needs to be cut away. Do you see how the color is lost in the upper left corner in the above photo? Think I'll be trimming that away. Pieces of white tulle were placed over the blossoms, then the excess trimmed away after free-motion stitching around the petals. 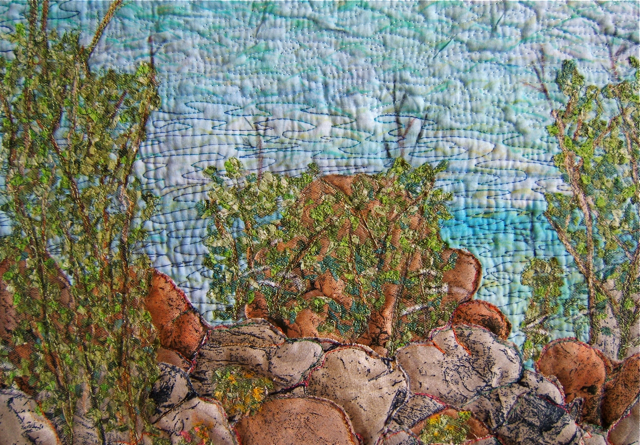 That stitching also anchors the calyx pieces which are loose on the surface. Some new growth pieces float on the surface as well. Now I'm really excited about this piece. 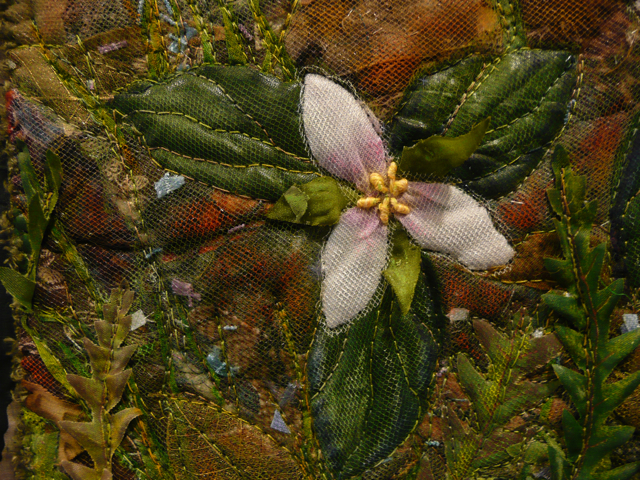 Next the yellow stamen will get embroidered and I have an idea about framing to pursue. 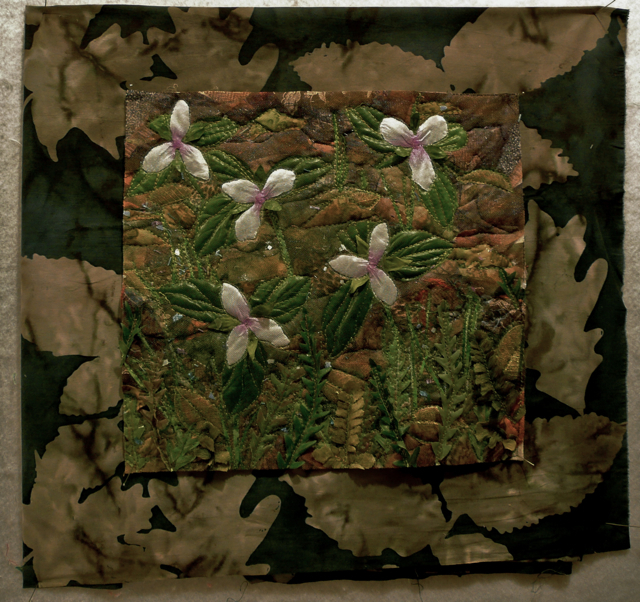 I very much liked the foundation of scraps for this wild flower piece. 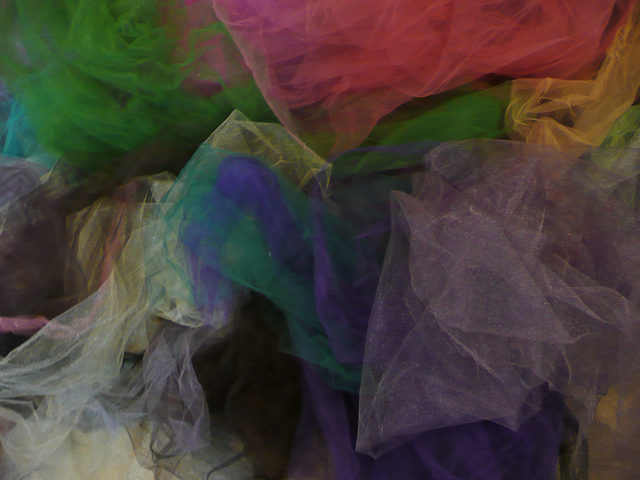 I have a lot of colors of tulle to select one to hold all these bits and pieces together ... and I debuted them all. The grayed lavender is the one that worked best to my eye. I quilted around the outside edges and just enough organic style lines through the center area to keep all those bits in place. 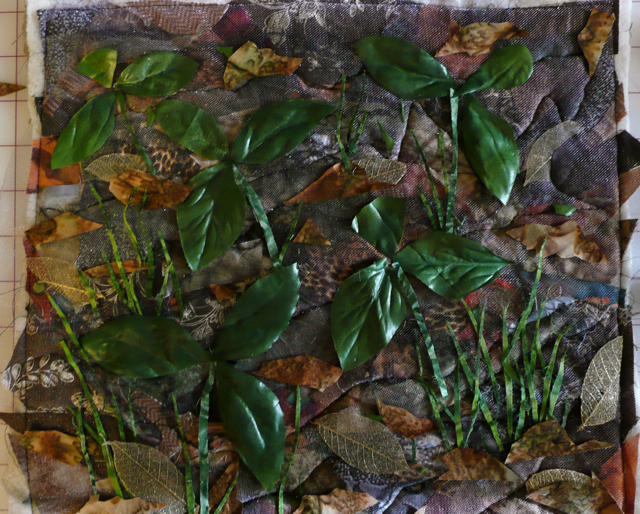 Then I added newly sprouted plants along with real leaf skeletons and more scraps of fabric. 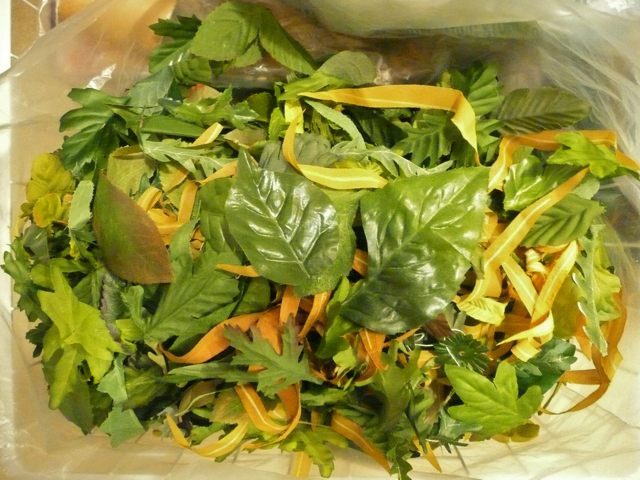 I have a huge bag of silk plant leaves. I kept digging until I found ones with the right hue, sheen, and veining. Very rarely do I use any "whole" leaves. You can see where one of the leaves for my plants was cut from that large one on the right. Can you guess what the flowers will be from my leaf formations? 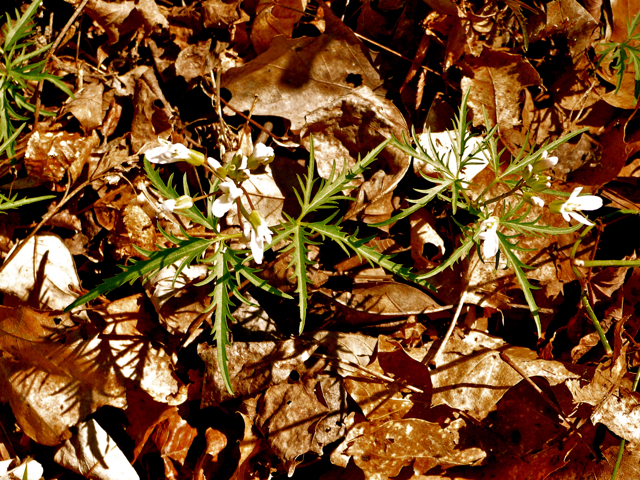 The coming of spring here in east Tennessee has been late. 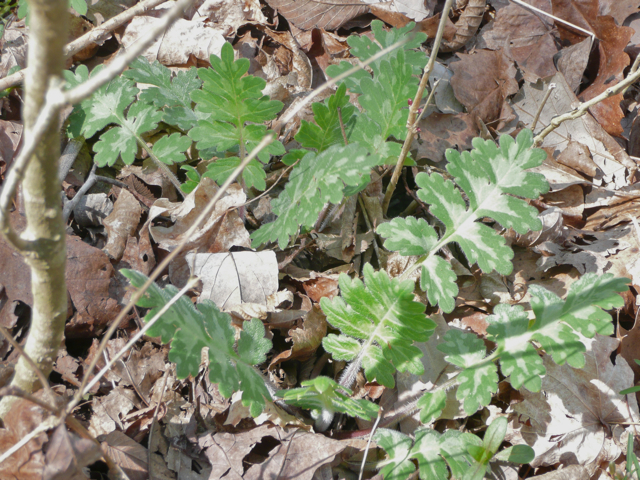 There were no new leaves on the trees and just a few sprouts of early wild plants. 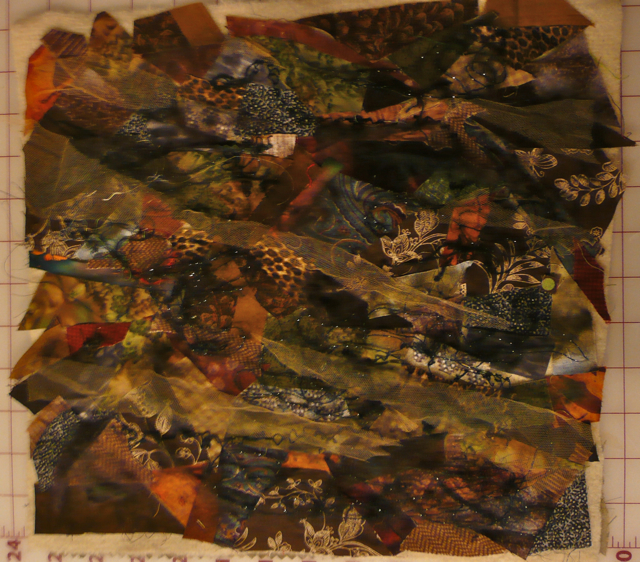 A second layer of thread and yarn scraps, plus scraps of tulle netting have been added. 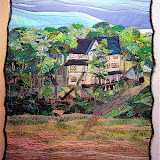 Now to do just enough quilting to hold it together, then I'll continue to build the picture. I still haven't decided which flowers will be growing through my woodland bed. 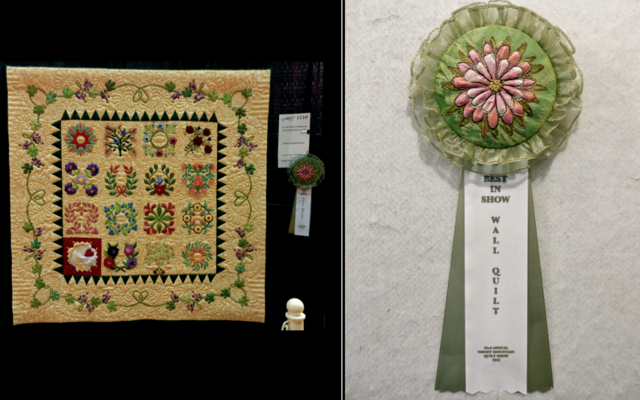 Just a reminder about the contest at the Quilting Gallery. Go here if you haven't yet checked it out. 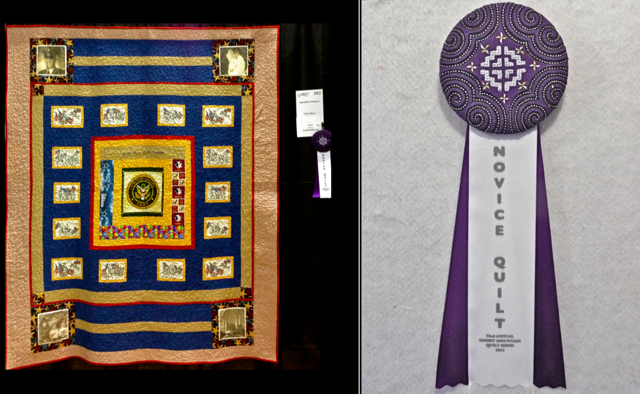 Voting for 4 favorite quilts from the 37 entries and entering the fat quarter give-away deadline is 6:00 p.m. (EDT). Have fun and good luck! 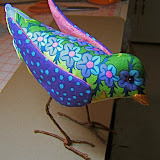 That's the theme for this weeks contest over at the Quilting Gallery blog. 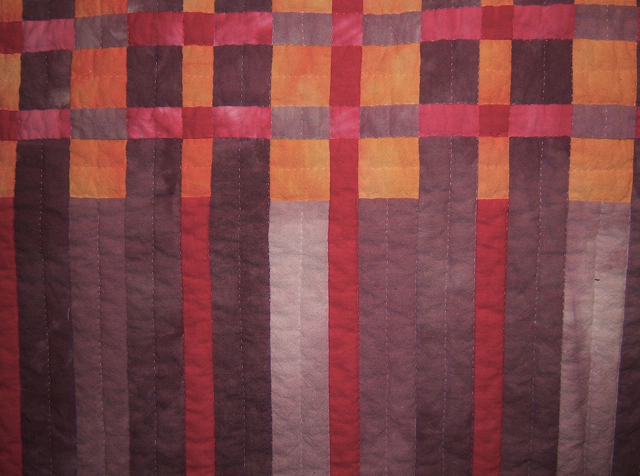 I've entered the cuddle quilt I had made for myself with the only fabrics and I had ever hand-dyed. You may recall reading about it on in a previous post here. 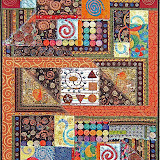 Click on the Quilting Blog's link at the beginning of this post to see 37 wonderful quilts. You get to vote for four of your favorites. 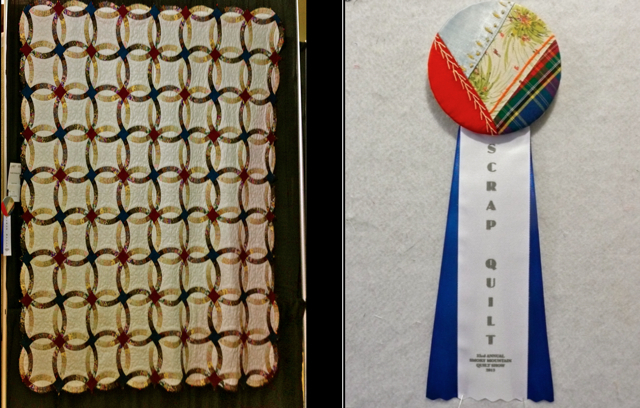 Approximately, how many fat quarters do you have in your stash and how do you organize them? You have until Monday, April 22, 2013 at 6:00 p.m. (EDT) to vote and enter the give-away. Have fun and good luck! 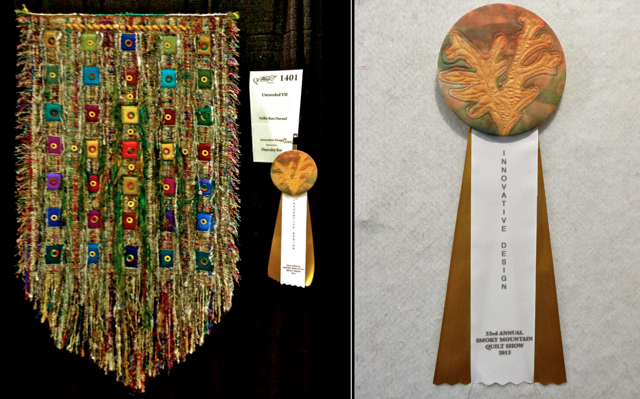 Again this year I was in charge of making the special award ribbons for the Smoky Mountain Quilt Guild Show that took place March 22-24 at the Maryville College in the Cooper Athletic Center. 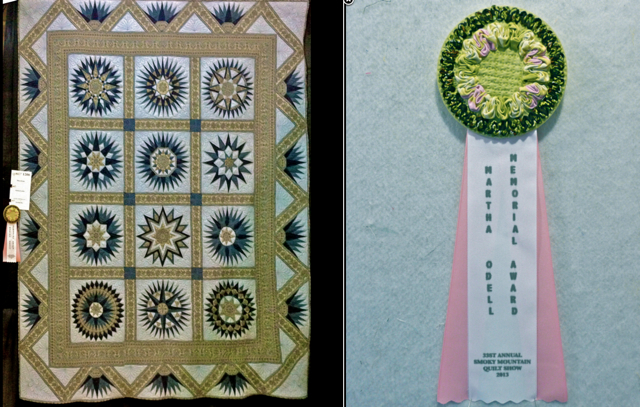 Guild members were invited to create rosettes for the various awards. 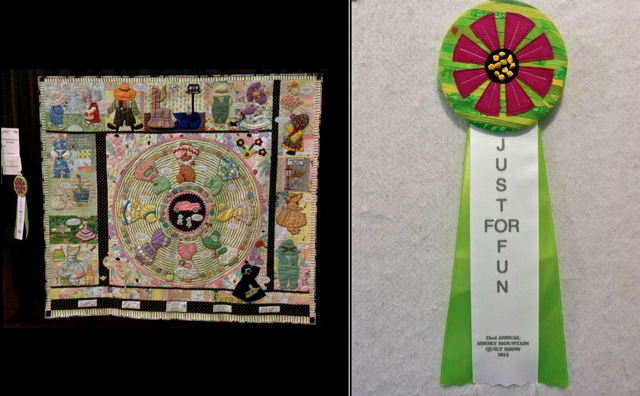 I then assembled them ... choosing the colored side grosgrain ribbons and printing out the award information on the satin ribbons. 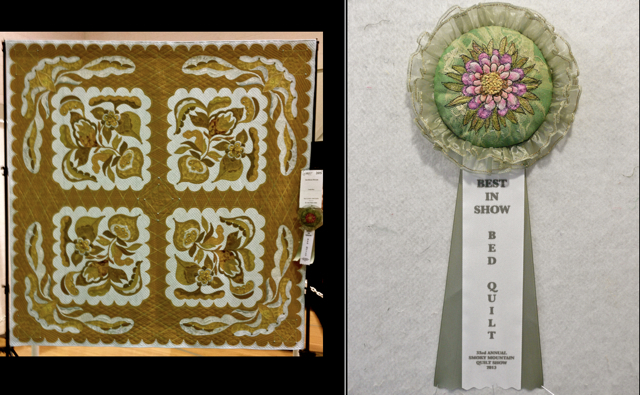 I've heard it said that these ribbons are coveted awards at our guild shows. 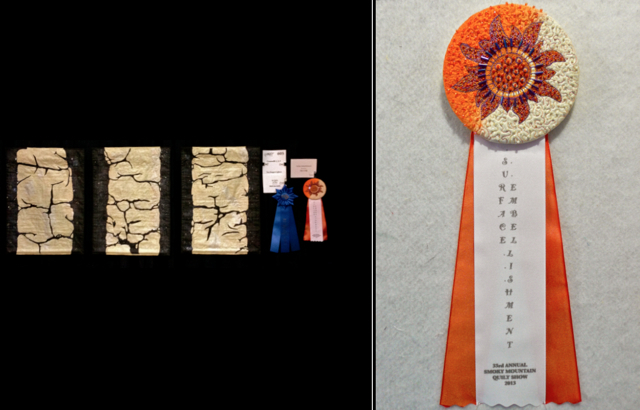 Go here for a tutorial for how I construct the award ribbons. 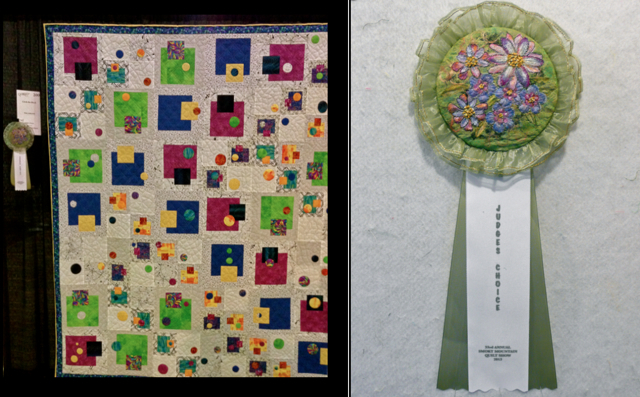 Go here to see ALL the ribbons (and the quilts they were awarded to) for the years I've been in charge of creating them. 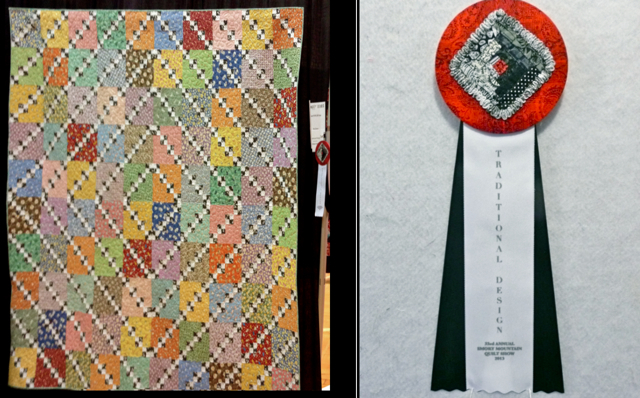 I've been delinquent in posting about the Smoky Mountain Quilt Show that took place recently on the Maryville College campus here in east Tennessee recently. 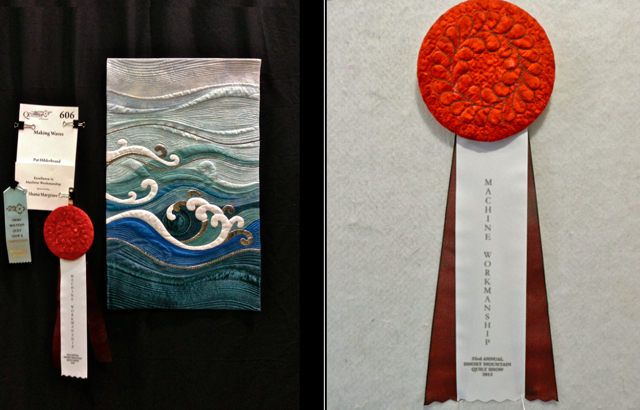 It's a pleasure to report that my three entries were each awarded ribbons. 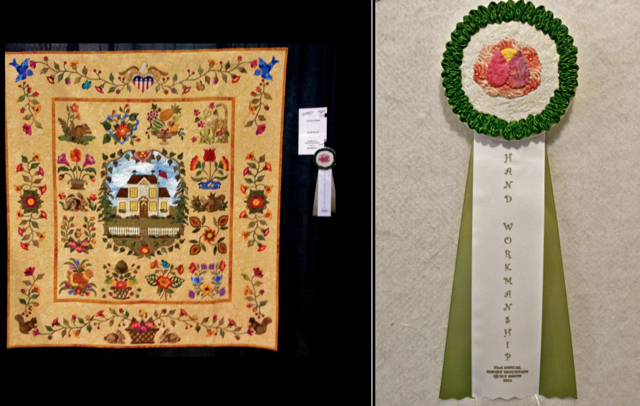 It won 2nd place in the special category for the Smoky Mountain Quilt Guild challenge pieces made for this year's AQS Guild Challenge. If our guild's entry is accepted, you'll see this one exhibited in Grand Rapids next August. 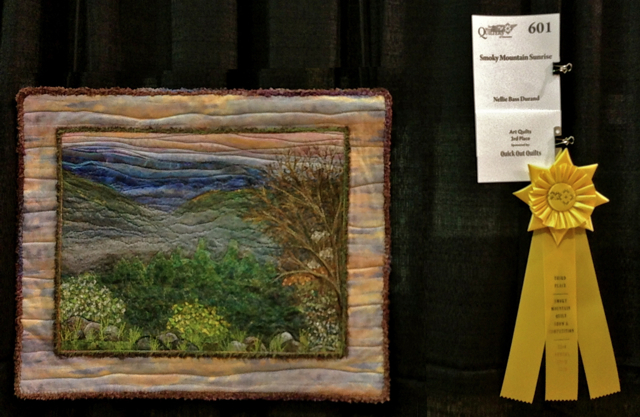 "Smoky Mountain Sunrise" 20"x 16"
It won 3rd place in the Art Quilt category. 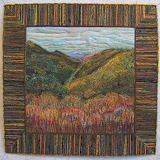 To see the beginnings of this piece as well as others that present variations of my favorite view in the Smokies go here. 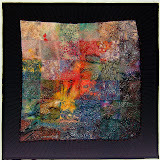 — An interpretative quilt using elements which are simple, yet sophisticated. 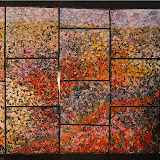 This hybrid form may include: improvisational techniques; an emphasis on negative space; a minimalist approach; simple shapes, patterns and quilting designs; clear, crisp colors with white or gray neutrals; graphic or large scale prints and/or an abundance of solids; asymmetry. 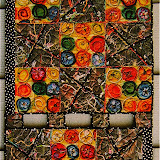 I was aware the texture of this piece was not what the "modern quilt" movement expected. 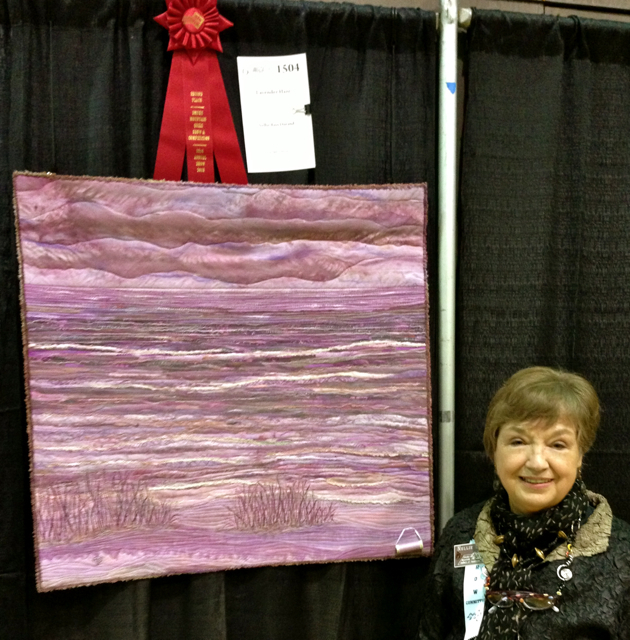 There was doubt expressed by several viewers that this piece was even quilted. 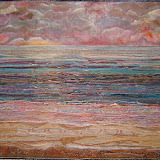 Granted it has the look of a woven tapestry piece. 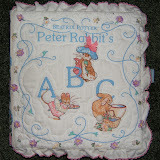 However, there's quite a lot of stitching and all of it functions as quilting. I'm especially pleased with how the length of yellow rick-rack worked in at the top. A piece of the raw silk stripped from the background fabric anchors the rick-rack by being carried across it and stitched back into the base fabric. 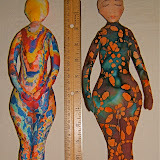 To read more about this piece scroll back a few posts. The first post was February 8th.